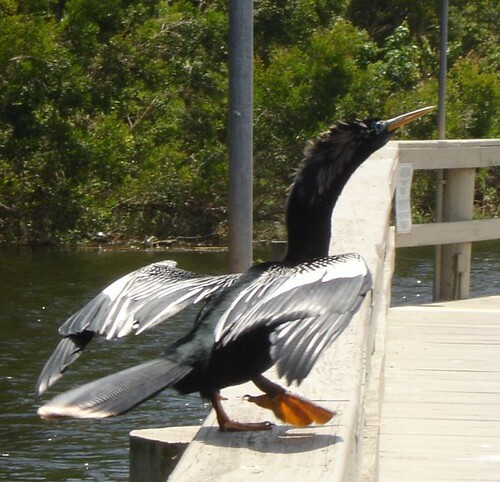 Palm Harbor, Florida: Electric Lizardland | Great Auk - or Greatest Auk? 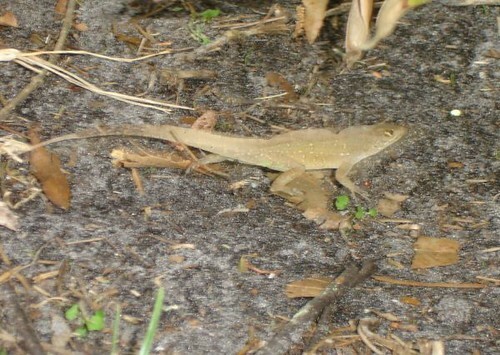 But even more than birds, Florida has reptiles. and properly poisonous snakes, not like the wimpy snakes we have up in New York… but we didn’t have the opportunity to photograph any of those. How sad. As a New Yorker, the concept of lizards just running around the landscape has a lot of novelty value. Seriously, I can’t get enough of them. So… reptilian! I love it! But back to the birds. Lots of birds, too. Lots of BIG birds. On the drive from the airport to The Inimitable Todd’s parents’ home, I added Brown Pelican, Black Vulture and Osprey to my year list, as well as Boat-tailed Grackle when we stopped for breakfast. Osprey and Boat-tailed Grackle would, as it turned out, be dominant themes during the whole trip. 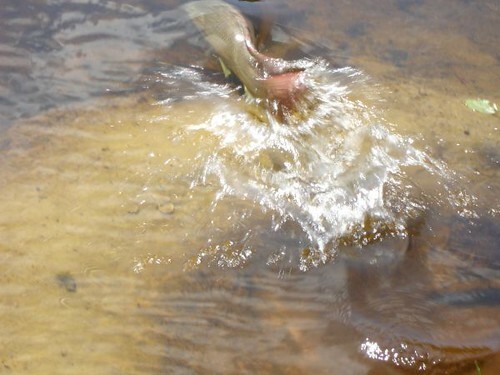 It would be very very hard to go anywhere in the general Lake Tarpon vicinity and not see them. We walked around the pond. An Osprey flew over (to save space, as I describe the rest of the trip you may just want to mentally assert “and then an Osprey flew over” at the beginning and/or end of each paragraph.) We came to the edge of a tree-row, and sighted another pond, half grown over with lilypads, just beyond, so we went to see if the alligator had moved to new digs. Strange fish half-jumped from little diggings in the edge of the water as we went, and it became our project to see if we could sneak up on well enough to get a picture of it before it fled. 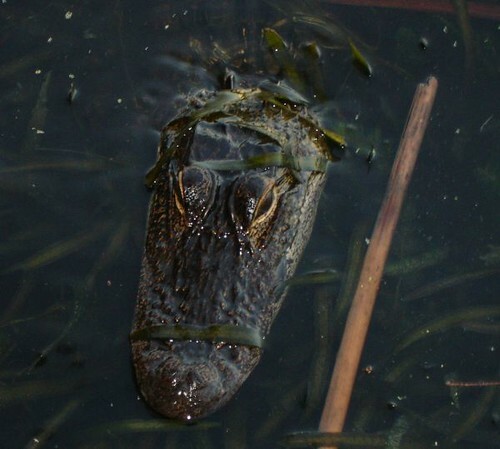 Apparently fish who live in alligator ponds don’t like to be snuck up on. Suddenly, while we were concentrating on the fish, a commotion broke out amongst the lilypads. I swung my binoculars up and locked on to a couple of Common Moorhens. Common Moorhens, which are sort of like American Coots but with extra Satan, do make their way up to New York in the summer. But these were the first of the species to ever have the good fortune to wind up in my presence, so I was pretty psyched to see them. The glow last until we were chased back to the road by a local neighborhood watch zealot. At least we weren’t tasered, and thus were still upright to hear a small buzzy sound coming from a short roadside tree. It took a bit of maneuvering and chasing, since the bird wouldn’t sit still, but finally I was able to lock it down as a Blue-Gray Gnatcatcher – a second life-lister in ten minutes that I should really have picked up in New York years ago. Shades of the San Francisco Brown Creeper Incident. Slowly – being still dressed for April in New York rather than April in the subtropics – we wended our way along. It was a bit disconcerting to see Northern Cardinals, to me the consummate snow-birds, picking about under palms, but there they were. Finally we reached a little park on the edge of Lake Tarpon, where the Anhingas were out in force. Snakebird does a funky dance. There was more than just that afoot in this little spit of park, intended more for boat-launching and dog-walking than birding, though. A swampy area without enough open water to be dignified with the name “pond” held another Great Egret, a Great Blue Heron, and a pair of Mottled Ducks – Florida’s special entry in the Mallard-Black Duck sweepstakes, and my first truly irreplaceable life list entry for the trip. The Inimitable Todd was rather surprised that I was so insistent about photographing boring brown ducks. Along the path we encountered a cagey Tricolored Heron, who, perhaps rightfully irritated at being deprived of the more romantic “Louisiana Heron” tag, flew off before the IT got a good photo. Nevertheless, this was another life bird, and though it isn’t remotely inconceivable that I’ll add this one to my New York list one day, I might wait a good long time. I suppose that after a picture like this, even if I do ever see an Ivory-billed Woodpecker, the ABA will never buy it. 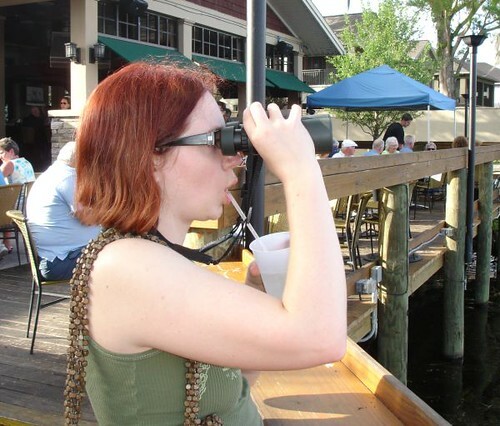 The dining establishment in question is Tarpon Turtle Grill and Marina. From their open dining area, I added my last lifer of the day: a flock of White Ibis head home after a long day. 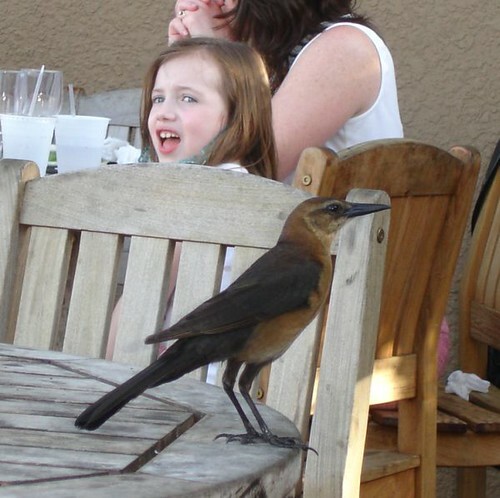 The Boat-tailed Grackles here were notable for their complete lack of shame. The Inimitable Todd was quite taken with them. So ended the day, with my life list five species up and my year list burgeoning… and the real birding of the trip had scarcely begun! All photos, as always, by the Inimitable Todd. The Mottled Duck had me drooling all over the keyboard! “sort of like American Coots but with extra Satan” …classic! I have to concur with both you and Jochen. For some reason, I took inordinate pleasure in spotting (and actually identifying) Mottled Duck a couple of years back. 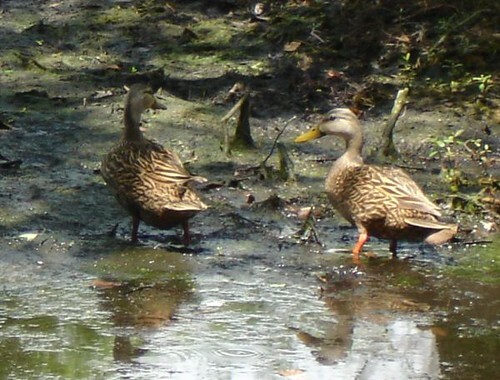 Not that it will matter much when the mighty Mallard subsumes all its spawn.